The first thing people want to know about Bruce Irvin is how many snaps he’ll take in Seattle. Pete Carroll claims he can play 600-700 snaps initially in the Raheem Brock role, but others have argued that Brock featured in around 550 snaps. Either way, Irvin can still have an impact at 500 snaps. Before San Francisco’s week-16 meeting with Seattle in 2011, Aldon Smith had featured in 446 snaps. That was 377 less snaps than defensive rookie of the year Von Miller and 267 less than JJ Watt. Smith still managed to accumulate 13 sacks, 12 quarterback hits, 30 quarterback pressures and two forced fumbles. In comparison, Miller had 11.5 sacks, 19 quarterback hits, 28 pressures and three forced fumbles, despite playing nearly twice as many snaps. Watt had 4.5 sacks, eight hits, 24 pressures and two fumble recoveries. Stats aren’t everything, but it goes to show how Irvin won’t necessarily be required to play even 2/3’s of the team’s snaps to have an impact. Grading a draft right after it happens is… well… it’s kind of stupid. As much fun as it is to read good (or blistering) reviews, we all know this to be the case. But as much as ignorant people allow those draft grades to make up their minds for them, and for as much as smart people love making fun of grades before any of the players have taken a professional snap, the truth is actually somewhere in the middle. Let me give you an example to illustrate what I mean. Richard Sherman wasn’t a pro-bowler last year, but he should have been, and he’ll probably have many pro-bowls in his future. By just about every metric, he was among the best corners in the league last season. Richard Sherman was a 5th round pick just last year. If we were to do a re-draft right now, Sherman might be a top 10 pick. But here’s the thing, Seattle didn’t have to trade up into the top 10 to get Richard Sherman. He was under the radar. Way under the radar. Sherman was so far under the radar that even his college coach didn’t draft him. Even the Seahawks didn’t think Sherman would be this good this quickly. That said, while it’s best to grade a draft after seeing how that player pans out in real games, we also can’t forget how these players were graded at the time. If you know you can get a good player later, you take him later and you take another good player sooner. Especially if that player is a guy that might be a product of the system. Seattle did exactly that with Kam Chancellor, a player they had rated much higher than the 5th round. They could have taken Chancellor in the late second or with either of their 4th rounders, but they put it off because they (correctly) deciphered that Chancellor’s lack of top speed would allow him to be available later. John Schneider is a hell of a poker player, and his ability to read the hands of other front offices has proven valuable time after time. Seattle could have taken those players earlier, but because they didn’t, they pocketed players like Walter Thurmond, Golden Tate, or KJ Wright. Knowing when to take a player is just as important as the player himself. And in that respect, we can at least partially grade the 2012 draft right now. So rather than grade this draft based on my own ratings for the players, I’m going to grade this draft based on decision making. Did they accomplish the team’s draft goals? Did they draft players earlier than they needed to? Did they get good value from their trades? In other words, when John Schneider went to bed Saturday night, did he sleep soundly knowing that he just had the draft of his dreams, or did he lie awake all night second guessing the decisions he made? Add a running back in rounds 1-3. Add a quarterback in rounds 4-6 (possibly earlier) . Pete and John’s plan was to spend the #12 pick on a pass rusher, although they would have at least considered Trent Richardson had he fallen to that pick. They also really liked this year’s group of running backs and thought it would be a great opportunity to draft Lynch’s future successor out of this group. Finally, they were impressed by a lot of quarterbacks outside of the first round and felt this would be a good year to finally draft a quarterback. In addition to those goals, the front office had also stated on numerous occasions that they wanted to get faster at linebacker. While it wasn’t a stated goal or something we were told by an inside source, an assumed fifth goal of this front office was to add picks in the draft. Seattle’s draft philosophy is built around drafting by volume, and the Seahawks entered this draft with only six picks after selecting nine in each of their previous two drafts. This was one of the most shocking picks in recent NFL Draft history, being rivaled only by Tyson Alualu by Jacksonville at #10 a couple years ago. Giving this pick an “A+” grade might seem contrarian at best or LSD-laced at worst. However, the more I learn, the more this pick is looking like a master stroke. By now you probably know that seven teams had Bruce Irvin graded as a top 15 talent. We’ve heard plenty of rumors about teams like the 49ers and Chargers planning to take Irvin when their pick came up. Now we’re hearing that the Jets had planned on taking Irvin at the very next pick (Chicago at 19 and Green Bay at 28 were known to be considering Irvin too). The Seahawks wanted to add the best pass rusher in the draft, and with the possible exception of Fletcher Cox, it appears numerous other NFL teams (including a few known for their defenses) shared the Seahawks assessment of Irvin. In a recent press conference, Carroll told reporters that he was certain the Jets would take Irvin if the Seahawks had moved down again. It turns out Carroll was right. A lot of people graded this pick poorly because Irvin didn’t grade in the 1st round on draft analyst’s draft boards- including mine (group think strikes even me sometimes). What those people fail to realize is that amateur draft rankings are only estimates and are not binding. Bruce Irvin would not have slipped into the second or third round just because draftniks thought he would. What actually matters is how NFL scouting departments and front offices rate prospects, and multiple front offices had a top 15 grade on Irvin. If Seattle had gone a different direction, it would be the New York Jets getting heckled for taking Irvin right now instead. Irvin comes with a lot of risk, but if he didn’t he wouldn’t have reached the 12th pick in the first place, much less the 15th. He hasn’t been coached up as a pass rusher at all. He’s clueless with his hands. Despite looking very muscular and putting up a respectable bench press total, Irvin struggles with upper body strength against linemen. Irvin has decently long arms too, so his upper body struggles very likely point to a lack of technique. Irvin is one of the rawest players in the entire draft; he’s an athlete playing pass rusher. That said, athletically he’s a top five pick. When used in a 4-3 defensive end role and played wide of the tackle, he was a terror at West Virginia. He didn’t just have good production, he had good looking production, with incredible displays of speed and pass rush ability that were at times jaw dropping. Even when I had Irvin going in the 3rd round a few weeks ago, I said on this blog that he was the best pure pass rusher in the whole draft despite that grade. Irvin has rare speed to go along with fantastic change of direction skills and killer motor. I don’t know if I’ve ever seen a more impressive “hustle sacks” player than Irvin. John Schneider compared Irvin’s speed to Dwight Freeney, Von Miller, and Jevon Kearse. If Irvin were drafted by a lot of other teams, I might question the pick. Not so in Seattle. The Mountaineers used Irvin in a variety of looks and from that sampling it was clear that Irvin was at his best in a 4-3 end role- the wider off the tackle the better. Seattle’s 9-tech LEO position provides the perfect “training wheels” position for Irvin that allows him to produce early in his career and build confidence while still learning and improving his craft. Pete Carroll knows a thing or two about coaching up defensive players. I can’t guarantee this pick won’t flop, but I like Irvin’s chances of working out in Seattle better than just about anywhere else. I’m not expecting Bruce Irvin to have an Aldon Smith sized rookie year, but I do think there is a basis for the comparison. Smith was a widely ridiculed top 10 pick this time last year. Irvin was a widely ridiculed top 15 pick. As a rookie Smith nearly broke the rookie sacks record while only being used as a 3rd down pass rusher. Irvin will be very similar, inheriting the “Raheem Brock role” of a situational pass rusher that will occasionally spell Clemons at the LEO. By Carroll’s estimate, Brock saw nearly two thirds of Seattle’s snaps last year (although a source that tracks snaps put it closer to 50%). Irvin is a different player than Smith, but it’s not inconceivable that he could have an eight to ten sack rookie season as he is a perfect fit for Seattle’s system. If Irvin develops, he has scary upside. If he doesn’t there is a chance Seattle could still wring some production out of him anyway based purely on how his athleticism matches the wide nine pass rush role on Seattle’s defense. Seattle had a top 10 defense last season in both yardage and points allowed while also having a below average pass rush. If Irvin reaches his full potential, just imagine where Seattle’s defense could be headed. Seattle didn’t just take Irvin at #12 either, they traded down as far as they possibly could have while still getting their guy. The Eagles generously rewarded the Seahawks with a 4th and 6th rounder for the privilege, which also helped the team achieve its assumed fifth goal- expand their number of draft picks. Those picks turned into pass rushing defensive tackle Jaye Howard and another highly intriguing big corner with tools in Jeremy Lane. Given that Howard comes with the Dan Quinn seal of approval and that Pete Carroll has been money with late round corners, Seattle added not one but three interesting defensive prospects with their first pick. The combined upside of Seattle’s first round haul is in the stratosphere, and for a front office that has won on so many of their long shot gambles through good coaching and proper scheming, it’s hard not be excited about that. Seattle gets the speedy coverage linebacker they needed, and gained valuable extra picks in the process, but I’m not completely convinced that Seattle would have repeated their actions here if given a redo. John and Pete’s press conference enthusiasm for Wagner was noticeably less enthusiastic than for their Irvin or Wilson picks. Mychal Kendricks graded higher than Bobby Wagner on most, though not all, draft boards. Kendricks also had the Pac-12 connection and had the higher upside of the two, which would have appealed to Pete Carroll on both counts. Despite what Mel Kiper thinks, Bobby Wagner was not a reach, and if not for the Morris Claiborne trade, Wagner wouldn’t have even made it to the 47th pick. Depending on how Seattle graded the other linebackers, they may have really dodged a bullet. Losing both Wagner and Kendricks after moving down four spots would have been a minor fiasco. I’ve made it no secret I was highly impressed by Lavonte David. I was hardly alone in that assessment, as a lot of mock drafts had David going well before the 43rd pick. Seattle passed on David twice. That may prove to be a poor decision in hindsight. I can’t say I’m completely surprised though, as David is a classic Tim Ruskell second round pick, and Pete Carroll has tended to take a different route in the second round. David is a prospect that might already be playing his best football, and Pete seems to gravitate towards players who’s best football is still ahead of them. And what about Zach Brown? The team rated him very highly at one point early in the draft process. It might have possibly broken their hearts to see the Eagles nab Kendricks right in front of them, but there were still three or four quality linebackers left who had speed. Why not trade down again? Overall, the way they handled the 2nd round picked looks “botched” to me. That said, the Seahawks did satisfy their goal here- they did get a fast linebacker, maybe the best man coverage linebacker in the whole draft. I’ve been saying for a while that Wagner seemed like a Pete Carroll kind of linebacker to me, even if I had him graded lower than most. Seattle also added two more picks with their trade down, putting their draft total up to a whopping ten picks. Those picks turned into Korey Toomer, a toolsy linebacker I had mentioned before the draft that had drawn strong interest from NFL teams, and Greg Scruggs, a guy who John Schneider called his favorite value pick in the draft. Wagner probably won’t emerge as much of a play making middle linebacker, but he has a good chance to be the kind of “glue that keeps the defense together” middle linebacker that has a ton of hidden value. His speed will also help reduce the liability Red Bryant presents against speedy running backs, and Wagner’s ability to cover ground should dramatically improve Seattle’s ability to defend passes to running backs and tight ends- a major weakness on the defense. I wasn’t expecting Seattle to draft Russell Wilson this early, but I do not think they reached in doing so. Pete Carroll told reporters that he was contacted by two teams who let him know that they would have drafted Wilson later in the same round had the Seahawks not done so. I graded Russell Wilson very highly and I haven’t been ashamed to admit it. Though as I alluded to in the opening of this article, you don’t always have to take a top talent early if you know you don’t have to. Wilson has the talent to be one of those guys who goes in the first round of a future draft re-do article, but there was no need to take Wilson earlier than this. John Schneider and Pete Carroll badly wanted Wilson, and got him at essentially the latest possible moment they could have. Wilson has his share of fans in NFL circles, but even they knew that taking Wilson in the first round wasn’t necessary. Taking him in the second round probably wouldn’t be necessary either. Drafting well isn’t just about staying true to your board, it’s also about getting guys at the right spots, which can be a tricky thing. I hate comparing Wilson to Drew Brees, because Brees is one of the greatest quarterbacks of all time, but Wilson isn’t wrong when he compares his situation to the one Brees faced in 2001. Like Wilson, Brees was not an under the radar talent in college. Everyone in the country knew about Drew Brees and the immense amount of talent he possessed. Like Wilson, Brees led his Big Ten team to a Rose Bowl berth where he lost in a hard fought match to the Pac-10 champion. And yet, despite his obvious talent, Drew Brees was not a first round pick, sliding to the first pick in the second round. Every quarterback hungry team in the league passed on Brees in the first. Why? Either because they discriminated based on height, or because they thought they could get Brees later based on his perceived market value. Teams were afraid of drafting Brees early, because if Brees flopped from his lack of height, it would make the pick look so much worse in retrospect. It’s the kind of first round pick that could very easily cost a GM his job if it goes wrong. This made the selection of Brees a curious game of chicken. Teams knew about his talent and what he could do, but who would be the first team to bite and where would it happen? It’s a process that might best compare to the Japanese “posting” system to determine where Japan’s best end up playing in the Majors. Players such as Ichiro, Daisuke Matsuzaka, and Yu Darvish are famous examples of this. Teams submit secret bids to the Japanese owner with no knowledge of how much other competing teams bid for. The team who submits the highest bid wins the rights for the player. Replace high dollar amounts with a higher draft pick and it’s a very similar idea. The Seahawks had to play a delicate game of not pulling the trigger too early but also not waiting until it was too late either. And as we now know, they timed it just right. If Seattle hadn’t picked Wilson with their 3rd, he wouldn’t be a Seahawk right now. However Wilson’s career turns out, the Seahawks should be commended for guessing Wilson’s draft stock just right. So why do I like this pick so much? Because I could hardly give a damn if Russell Wilson is an inch and a half shorter than Drew Brees. Any quarterback under 6’2″ is probably going to be a throwing windows quarterback in the NFL. It’s not like you can be too short to be a throwing windows quarterback either. It’s simply a question of can you do it or can’t you? Plenty of short quarterbacks have shown they can’t. Max Hall is two full inches taller than Wilson, but failed miserably in the NFL because he couldn’t see downfield. He didn’t have the mobility and the skills necessary to overcome his 6’1″ height. Max Hall was a solid college quarterback at BYU, but concerns about his height proved to be completely justified. Wilson is a different case. He’s proven that he can play behind tall NFL lines. His line at Wisconsin was one of the tallest in the country, NFL included. Wilson was able to overcome his height because his line pass protected well enough for Wilson to complete his deep drops, and at the back of those five and seven step drops height becomes far less of a factor. Like Brees, Wilson makes a lot of quick movements in the pocket to look through passing lanes. Wilson also has a very high release point- you could count his season total of tipped passes on one hand. After researching Wilson thoroughly, I am convinced he will not fail for height related reasons, assuming that he is schemed correctly. So why are there so few short quarterbacks in the NFL? The answer is because their aren’t many short quarterbacks in the college ranks to begin with, much less ones with talent rivaling Wilson’s. Even among the shorter quarterbacks with talent, very few get opportunities in the NFL. Chandler Harnish has serious talent, but he went one pick away from being undrafted. Austin Davis is the best quarterback for his school since Brett Favre, and he went undrafted (signed by the Rams). Bo Levi Mitchell has a lot of talent, but he went undrafted and unsigned, and might end up heading north of the border for his next career move. And then you have players who don’t know how to overcome their height issues or play for teams that don’t understand how to properly scheme around it. And while I respect the heck out of NFL scouting departments and front offices for their ability to evaluate talent, I think there are times when group think and mental laziness lead teams to make unfortunate assumptions. The Seahawks were not one of those teams on Friday. Pete Carroll knows exactly what he’s getting with Russell Wilson, and in case you didn’t notice, he’s pretty freaking excited about it. Seattle runs a similar style of offense that Wisconsin used and Pete Carroll is famous for adapting his team to make room for unconventional talents. The Seahawks and Russell Wilson are a perfect match. There is a lot more to discuss with Wilson, regarding why he could be great or why he might fall apart. I’ll save that for a future article. But for now, I’ll say this: I truly believe that Russell Wilson will be a starter at some point in his NFL career and given the investment Seattle paid and the unrestrained enthusiasm for Wilson exuded by both Carroll and Schneider, I do not think they drafted Wilson just to compete as a backup- I really believe they drafted Russell Wilson in the hopes that he can be a franchise quarterback. Pete didn’t compare Wilson to some backup, he compared him to Fran Tarkenton. And for those comparing Wilson to Seneca Wallace, let’s not forget that it was Pete Carroll himself who once traded away Seneca Wallace for peanuts. The more I have studied Russell Wilson the more convinced I’ve become that he was going to be a gem in this draft. Not quite a Drew Brees or Tom Brady level steal, but something that could at least compare to it. That’s why it was so painful to think about the Seahawks potentially not drafting him, and why I was so excited to hear Wilson’s name called at the 75th pick. To the outside media, perhaps even to many Seahawks fans, Matt Flynn is the presumptive QB of the future here in Seattle. I’m not so sure Pete and John see things that way. The preseason quarterback battle will tell, but I’d bet you the powers that be are secretly pulling for Russell Wilson to emerge from that group. It can be argued that Seattle should have taken Lamar Miller here, but the blow is softened by the fact that Seattle still landed a very good running back with their next pick anyway. I had Miller rated higher, but that rating was based off tape alone and didn’t factor whatever that injury concern was that caused Miller to plummet down draft boards. It’s very possible that Robert Turbin topped Seattle’s draft board for running backs at #75 anyway. I wasn’t sure how to feel about the first three rounds of Seattle’s draft at first. Wagner was fairly low on my list of favored linebackers, and while I was stoked that Seattle wound up drafting my two favorite prospects in the entire draft, I didn’t like the “reach” factor of those first and third round picks. However, after reading further into the situation, it appears that Irvin was a terrific value at #15 and wouldn’t have lasted another pick. Russell Wilson similarly would not have lasted much longer. With that knowledge in hand, I’m able to enjoy the picks for what they are: two high upside selections at positions of supreme importance and massive need. I also liked that Seattle added four picks with two very small trades down the board. The only notable options it cost Seattle were Fletcher Cox and Mychal Kendricks, and neither one would have been my preferred option at #15 or #47 anyway, had the call been mine to make. My first day writing for Seahawks Draft Blog came only a week or so after Pete Carroll was hired here. I’ve now followed three Pete Carroll / John Schneider drafts with an uncommon degree of attention. Out of all those drafts I’ve seen Pete Carroll exhibit plenty of excitement, but I’m not sure I’ve ever seen him as happy to draft a guy as he was for Bruce Irvin or Russell Wilson. The only other player that even comes close was Earl Thomas in 2010. Irvin and Wilson have their flaws, but both have the potential to be franchise players. Pete drafted them knowing those flaws fully well, and he’s got a plan in place to work around them. If Carroll can get the most out of both of them, watch out. First of all thanks to everyone who attended today’s two-and-a-half hour marathon live-chat session. If you missed it and want to look through what was discussed, click here. Tomorrow we’ll begin to go through the tape as we review Seattle’s draft picks. We’re also going to start looking ahead to the 2012 college season, earmarking which players to keep an eye on. There’s a top-30 watch-list coming your way this week… already. I feel compelled to respond to some of the above. For starters, people can stop scratching their heads about the Bruce Irvin pick. It’s long been established now that other teams would’ve taken him in round one, including possibly the New York Jets at #16. In a draft where teams were willing to trade out of the first round just to flip fourth rounders and draft a 29-year-old rookie quarterback with the #22 pick, why should anyone be surprised Seattle drafted a pass rusher who ran faster than Von Miller at the combine and had over twenty sacks in two years at West Virginia? It also seems that certain pundits are ignoring scheme with their grades. The Seahawks really had no position for Quinton Coples, who may well end up as a five-technique in New York. They did have a position for Bruce Irvin, however. A position called the LEO, which has produced 20+ sacks for Chris Clemons in two seasons. Raheem Brock approached double figures in 2010 in a supporting role. If Bruce Irvin can contribute around ten sacks in 2012, will anyone complain about the pick? Taking Irvin at #15 was a surprise and it’s understandable why it will be considered a reach. But he also ran an official 4.50 at the combine, managed a 1.55 10-yard split and blitzed every other participant in the three-cone drill. Even as a specialist, he’s produced results. In many ways, you know the strengths and weaknesses of a player like Irvin. Chandler Jones – a universally approved pass rusher from Syracuse – has nowhere near the same level of production and is much more of an unknown quantity. Irvin may not be an every down star, but if he contributes – rest assured that’ll be more than some of the players taken in this draft. As mentioned earlier, later this week I’ll be publishing an early top-30 watch-list for the 2012 college season. In the meantime, game tape of three of the prospects that’ll be listed can be found below – Star Lotulelei, Tyler Wilson and Montee Ball. Give us your take on the 2012 draft. Regardless of whether the Seahawks actually had a great draft or not, I found this year’s draft to be one of the most rewarding that I’ve ever followed. Bruce Irvin and Russell Wilson were my two favorite players in the whole draft, and I had no expectation that either would become Seahawks. 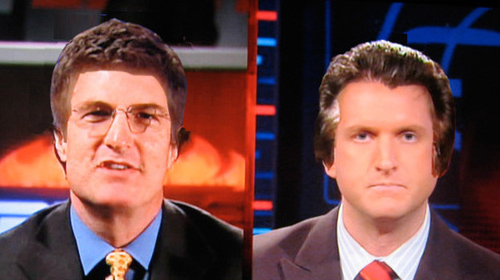 So seeing Seattle draft them, even if it was earlier than people like Mel Kiper expected, was pretty neat. Robert Turbin was another player I’ve really liked for a while now. In all my years of following the draft, this was the first one where I felt like the front office’s wavelength on their favorite players matched my own. I also thought it was really neat that Seattle drafted both Bobby Wagner and Robert Turbin (purely by coincidence). The two had a special relationship at Utah State as the two big stars on a small school team. Now the experience of leaving home for the big scary NFL will be made easier by having a friend close by. In the previous two drafts combined, the Seahawks drafted one player that I covered pre-draft. This year, each of their first four picks were guys I had scouted and written reports on, and two others (Toomer and Lane) were names I mentioned here on the blog in the last couple days. I even included Korey Toomer at #9 on my top 10 linebackers (from the front office’s perspective) list. I was watching the draft with some family members, and I actually called three Seahawks picks seconds before they happened (Wagner in round two, Turbin in round four, and Toomer in round five), while guessing the correct positions in round one and with both of our sixths. I’m not saying that to brag, but only to say that it feels really awesome to guess so many things right. It’s more fun to follow the draft when you feel like you have your finger on the pulse of it. There were a few sad parts of this draft though. Dwight Jones was one of my favorite receivers in the draft, and he not only went undrafted, but as of this writing he has yet to sign with a team as a UDFA. He’ll get signed eventually, (maybe he’s holding out for money? ), but he’s a guy I would have spent a day three pick on in a heartbeat and he may not even get much of a chance in the NFL. Chris Polk also went undrafted despite being arguably the best running back in modern Washington Huskies history (alongside guys like 1st rounder Napolean Kaufman and 2nd rounder Corey Dillon). Polk signed immediately with Philadelphia (a good fit), but still, it was heartbreaking to see that. There are two things that can damage draft stock like no other- major character risks and degenerative injuries. Polk was a fringe first round talent that fell completely out of the draft because of reports that his shoulder was degenerative (which he denies). Polk started 38 straight games for Washington (and produced) despite whatever issues he had. I feel terrible for the guy. Most players that go undrafted expect to before hand, or are at least prepared for it. Polk should have been a 4th or 5th round pick at worst, so this couldn’t have been easy. Like a bride getting stood up at the altar, what should have been the greatest day of his life becomes his most painful memory instead. Godspeed Chris. I loved the fact that this year’s “Mr. Irrelevant” was Chandler Harnish. They may have to change the name of that distinction if Harnish has the kind of career ahead of him that I think he could have. Too bad he’ll be stuck behind Andrew Luck, at least for the time being. Blah, blah, blah, what about Seattle’s picks? Oh yeah, sorry about that. Robert Turbin is a guy I covered in my draft spotlight series. Though I did not say so in print, he was one of those players (like Bobby Wagner) who I had a sneaking suspicion would be a very likely candidate for Seattle. I guesstimated Turbin to be the 6th highest running back on Seattle’s board, and even said that “it honestly wouldn’t blow me away if Seattle took Turbin at #43.” Turbin is a near clone of Marshawn Lynch. The two have similar size, similar speed, similar styles, similar attitude, and similar strength. Turbin calls himself “the Hulk” for his physical style of play. This is a great pick for Seattle. Turbin can provide injury insurance for Lynch in the short term while having strong potential to replace Lynch in the long term. If Seattle had passed on Russell Wilson at #75, there is a decent chance they may have taken Turbin there, given Lamar Miller’s injury related uncertainty. So getting Turbin in the 4th as running back options were drying up has to feel pretty good for John Schneider and company. Jaye Howard is a penetrating 300 pound pass rushing DT from Florida. As you may recall, the defensive coordinator for Florida is none other than Dan Quinn, who did a very good job identifying and developing defensive line talent when with the Seahawks the last several years. As with Josh Portis, we’ve seen that coaching connections can have an impact on players getting brought in, and I think it’s distinctly possible that Quinn made the hard sell to Carroll for Howard’s NFL prospects. Getting the assumed Dan Quinn seal of approval is enough to make me optimistic about this pick. I’ll have a scouting report on Howard up this week some time, but the short version is that he’s athletic and has great arm use, but looks a bit lazy and struggles badly against the run. That said, his upside if motivated could be another Rocky Bernard. Korey Toomer was maybe my favorite pick of day three, in that I highlighted him early this week as a cheaper alternative to Zach Brown. Despite not being listed by a lot of draft sites, Toomer drew strong interest from NFL teams due to his rare size and athleticism. I thought I made it pretty clear that I wasn’t a fan of Zach Brown, but I came to terms with it because Brown was a terrific physical specimen and Carroll has a strong track record of developing talent. I wasn’t looking forward to Seattle spending a 2nd round pick on Brown, but I was prepared to accept it. Seattle passed on Brown and then instead opted to take a very similar player in Toomer three rounds later. In terms of measurables, Toomer is 95% the specimen that Brown is, but he comes at a tiny fraction of the cost. Great pick by the Seahawks. I don’t think Toomer is going to be handed a starting job, but given how much Pete has preached speed at linebacker, and the fact that as of this moment Leroy Hill is still our starting weak side player, I have to believe that Seattle drafted Toomer with more than special teams in mind. Between Allen Bradford, Malcolm Smith, and Korey Toomer, we’ll have three weak side linebacker prospects with above average speed competing to replace Leroy Hill in the future. Hill is a good player and coming off his best season in years, and he’s hardly slow, but he doesn’t possess the same kind of speed those three do. The Seahawks have done incredibly well with their competition mantra thus far, and I’m really looking forward to the competition for the distinction of becoming Seattle’s future WILL linebacker. EDIT: Per Pete Carroll in his day three press conference, the Seahawks will start by giving Toomer looks at SAM. Toomer believes he can play at all three spots. Jeremy Lane was a player I listed yesterday as a guy to watch on day three. As I said then, I had a feeling that Seattle would add some more late round defensive backs this year as it was hinted at in the pickup basketball game rumor. Seattle also spent more than a quarter of their team invites on defensive backs, which was also a pretty big clue. Jeremy Lane was one of five defensive backs invited by the Seahawks. I don’t have a personal opinion on Lane yet, but I did stumble across a well written report on him. Lane has good size (6’0″, 190 pounds at combine), solid speed (4.53/4.48 forty), and has a rare combination of long arms (32.16″) and a high vertical (39.50″). Only 6 out of 53 corners at the combine had longer arms, and only 2 out of 53 corners had a higher vertical jump. John Schneider has often talked about how he values long arms as an asset in coverage. Lane is tall, he jumps very high, and he has very long arms. Quarterbacks are going to hate having to throw over the top of him. Oh yeah, Lane played press corner, and is good at jamming receivers at the line. Of all the picks on day two, I think Lane has the best chance to be this year’s Kam Chancellor or Richard Sherman. Which I guess is fitting since he just missed the fifth round by only two picks. Winston Guy is a hard hitting strong safety that has drawn some comparisons to Kam Chancellor. Guy was injured and ran a slow forty at the combine, but healed up and posted a 4.53 at his pro day. Guy is 6’1″, 213 pounds, with very long 33″ arms and a solid 36″ vertical. Seattle now has two quality depth options at strong safety (Jeron Johnson being the other). Guy will make a contribution on special teams immediately, and could see the field in extra DB packages. EDIT: Carroll said that Guy will take over for the role that Atari Bigby filled last year. JR Sweezy is a Mansfield Wrotto type pick, having played defensive tackle in college but is now being moved to guard as a project. Wrotto didn’t work out of the Seahawks, and Sweezy probably won’t either, but he does have some intriguing qualities. Sweezy posted a 36″ vertical jump, tied for second among all defensive linemen. His vertical jump would be first among all offensive linemen. Obviously, linemen don’t need much in the way of leaping ability, especially on the offensive side, but vertical jump ability tends to correlate well with explosiveness, which would hint at Sweezy being a potentially explosive run blocker. At least one scouting report I read referred to Sweezy as having “sneaky athleticism.” Sweezy also has long 34″ arms, which is a nice plus. He fits the Tom Cable mold as having a high height to weight ratio. Greg Scruggs will compete to be depth at the 5-tech position behind Red Bryant. Scruggs stands 6’3″ and weighs 284 pounds, with monstrous 35.5″ arms. His arms are only a half inch shorter than Russell Okung’s. Scruggs also posted a 4.76 forty time, which is pretty solid for a 284 pound player. Scruggs wasn’t very productive in college. At first blush, this pick feels like EJ Wilson with freakishly long arms, but I’ll reserve judgement until we get to see him in preseason action. EDIT: Scruggs will play 3-tech in some nickle formations. If there is one thing that stands out from this group, it’s that John Schneider clearly has a thing for long arms. Robert Turbin was the only pick in the whole draft that didn’t have above average arm length. The same was true on day one. Bruce Irvin has decently long arms. Bobby Wagner had some of the longest arms among inside linebackers. Even Russell Wilson has decent arm length for his height. To me the most surprising thing about Seattle’s 2012 draft (other than the Irvin and Wilson picks) was that Seattle had ten picks, yet didn’t draft a single Pac-12 player. Pete Carroll has gone on record saying that 2012 would probably be his last year where his insider knowledge of the Pac-12 would work to his advantage, so I was pretty surprised to see them completely avoid the conference. Then again, they may very well have drafted Mychal Kendricks at #47 if he was available, and they did bring in receivers Tuinei and Kearse in undrafted free agency. Still, I was expecting a lot more activity out of the Pac-12 than that. Kearse has a chance to make it in the NFL, but he’s going to have his work cut out for him on a roster that is already bursting at the seams with backup wide-receivers. I’ll probably write about him in more detail at a later time. Anyway, that’s it for now. It’s silly to hand out instant-reaction draft grades, but I feel like being silly, so I’ll have a draft grade post up later today tomorrow. The 2012 NFL Draft is in the books. Seattle came away with ten new players, including five additions who play in the defensive front seven. Only three of the picks were spent on offensive prospects – a new quarterback, running back and a defensive tackle who will convert to guard. It’s an intriguing draft class, but also one that raises a number of questions. The one I’m wrestling with the most is the choice of Russell Wilson in the third round. When a quarterback is drafted in round one, you fully expect that player to start quickly if not right away. In round two, you’d recognise it in a similar way – just with a little less hype. Quarterbacks drafted in rounds 4-7 come with barely any expectation. Round three is the middle ground, the dividing line between expected starter and late round flier. Pete Carroll has spoken so glowingly about Wilson, it’s raising expectations. At one point yesterday he went on the record stating, “More than anybody else that was alive in the draft, this guy gives you a chance to have a great player.” What exactly does that mean? That Wilson gives Seattle a better chance to have a great player than Andrew Luck? Even if this is a typically Carroll-esque piece of raw enthusiasm, it doesn’t half raise expectations within a fan-base that has been starved of a freshly drafted quarterback to root for. Language like that makes you believe Wilson could be, realistically, considered the quarterback of the future for this team. Then you wonder, what if he’s the quarterback for now? You look a little closer and notice the way he quickly transitioned to Wisconsin after leaving NC State. The Seahawks passed on other potential immediate starters in round three at different positions. They wanted Wilson, badly. Wilson was the keynote addition on offense in this draft class. The decision to switch JR Sweezy to guard is merely a hopeful punt. Robert Turbin was an expected target for the Seahawks as a speedy, muscular back who will take some of the strain away from Marshawn Lynch. Wilson was the star attraction here. Some of the prospects Seattle passed on in the process of spending that third round pick? Mohamed Sanu, a talented receiver from Rutgers. Michael Egnew, a thoroughly modern-day athletic tight end from Missouri. Lamar Miller, a potential X-factor running back who slipped due to health concerns before Miami traded up to grab him at the top of round four. Brandon Brooks, a highly rated offensive guard with huge size from Miami Ohio. All four could’ve had some kind of impact in 2012. Yet despite investing in Matt Flynn and somewhat backing Tarvaris Jackson to compete to try and remain the starter, Seattle added another quarterback to the equation. It’s as if Carroll and co. have decided improved QB play is the key to moving the offense forward. A review, perhaps, of the frustrating play from Jackson at times last year. So rather than try to add that skill player or the big offensive lineman, the Seahawks open up the quarterback position and try to find an improvement. This is the highest draft pick Seattle has spent on a quarterback for 19 years. If this isn’t with the intention of at least allowing Wilson to compete to start as a rookie, I’d be almost surprised. People expect Flynn to get the nod, but his contract isn’t so huge that he’s locked into the role. Jackson could find himself on the outside looking in if he doesn’t win out, given his deal is expendable. Josh Portis remains part of the roster but is he rated highly enough to stick around if the team only runs with three quarterbacks? The Seahawks want a quarterback who can facilitate a running game, which is exactly what Wilson did at Wisconsin. They want someone who won’t turn the ball over but can still make plays, and in four years as a starter in college Wilson threw 109 touchdowns compared to just 30 interceptions. Carroll has talked about young quarterbacks being ready to start earlier these days and appears willing to consider rolling with a rookie. At the same time, Seattle may feel like Matt Flynn deserves to have the edge in a tight competition this off-season. He’s started in the NFL, albeit only twice, and if the Seahawks only planned to use him as a back-up they may well have avoided some difficult questions a few weeks ago by choosing not to sign the former Packer. I come back to the grey area that is round three. If Wilson had been a second round pick, people would be asking ‘will he start’? If he’d been a fourth round pick, nobody would be expecting an early impact. The third round sits directly between those two extremes. We talked a lot on this blog about Seattle’s desire to add a running back early in the draft. A lot of people presumed the Seahawks were set having signed Marshawn Lynch to a new deal, while adding a couple of other guys to go alongside Leon Washington. However, this is a team being built around the run on offense. Lynch is the centrepiece, the MVP, the heart and soul of the unit. He also runs with a physical style that will provoke injury and he’s going to miss time in the future. It’s inevitable. When he didn’t feature against Cleveland in 2011, it had a major impact. The Seahawks want to avoid that in the future. Rather than look for a change of pace back or someone different to Lynch, the ideal was to find someone who could logically become a starter in their own right. Doug Martin and David Wilson left the board at the back end of round one, making it unlikely the team would find their answer in the second round. Lamar Miller and Chris Polk – two players who many thought could go in that region – both fell due to injury. Ronnie Hillman and Bernard Pierce both disappeared in round three and options were starting to run out. Enter the Turbinator. At around 5-10 and 220lbs he has the necessary size to deal with a workload. He ran a 4.50 at the combine and looked pretty ripped for a player running that kind of time. It’s that combination of size and power that will interest Seattle – he can run inside and pound or find the edge. 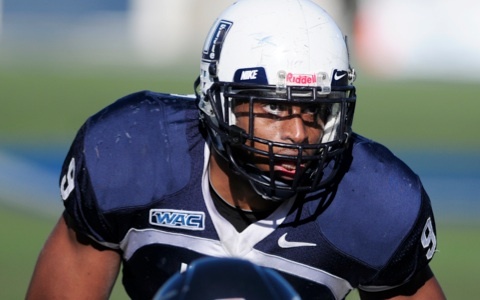 He’s shown some ability in space and in the passing game and has suffered due to the low-profile nature of the Utah State team he played for. He’s not good in pass protection, that has to be mentioned, but it’s something he can work on. Seattle ensured they have a younger version of the Beast in the stable, and it could be a crucial draft pick. The Seahawks need to be able to run the football, but also keep Lynch from injury-risk with too many carries. This was a smart pick and part of the plan in this draft all along. A year removed from spending two early picks on the offensive line and making some key offensive free agent signings (Sidney Rice, Zach Miller), this year the Seahawks went big on defense. Bruce Irvin will be expected to have an impact as the #15 pick in the draft. When you draft a specialist pass rusher in the top half of the draft, ahead of every other pass rusher in the class, he needs to be productive almost immediately. While the Seahawks have earned a reputation for intelligent picks late in the draft, they need to make sure they keep hitting in round one. Seattle’s can’t expect to keep finding fast starters with late round picks (such is the nature of the league) so to improve they’ll need an impact from the early rounds. It’s not a big surprise that defense was the focus this year. The Seahawks needed a pass rusher, whether you agree with the Irvin pick or not. That was the #1 priority – always was. There’s a reason why we paired the Seahawks with a pass rusher in every single one of our mock drafts from January to April. Clearly we didn’t focus in on the right players (although nobody pegged Bruce Irvin) but a pass rusher was key nonetheless. Linebacker was also an obvious need and it was no surprise to see that position addressed in round two. The rest of the picks come with a degree of the unknown. Korey Toomer may prove to be special teams fodder, alongside Winston Guy. Expect Guy to get the chance to fill the Atari Bigby vacancy. Jeremy Lane received rave reviews for a performance against LSU last season and could be another one of Seattle’s late round sleepers. I like 7th round pick Greg Scruggs as a physical specimen and watched footage of his pro-day where he looked the part and moved well. Jaye Howard is an underrated pass rusher from the interior who will knife through one-on-one blocks and could end up being the one guy who really has an impact from the R4-7 group. People are already asking why the offensive line and wide receiver positions weren’t addressed. The Seahawks made some moves last year at receiver and people shouldn’t write of an improved season for all with improved health and better quarterback play. If Sidney Rice and Zach Miller play at anything like their peak in 2012, you’re talking about two potential stars. Doug Baldwin continues to develop, while Golden Tate is facing a make-or-break season. Mike Williams deserves a chance to re-emerge after a disappointing 2011. As for the offensive line, don’t underestimate Seattle’s depth and appreciation for what they have already. The line didn’t miss a beat last year when James Carpenter and John Moffitt suffered injury and were then joined by Russell Okung. The players who stepped in were not big names or high profile draft picks, but they all thrived. Whether it’s Lemuel Jeanpierre, Paul McQuistan or Breno Giacomini – those guys deserve the chance to compete to start. Seattle has also added Deuce Lutui and Frank Omiyale, so will feel good about their chances of filling the hole left by Robert Gallery. A lot of people like to think you need five first round picks to make a good offensive line, but that simply isn’t the case. Overall it’s a draft class that will do well to provide Seattle with as many key starters as 2010 and 2011. The Bruce Irvin pick shocked the NFL and will be similarly lauded or hammered depending on the performance of ‘Brucemode’ this year. He’s an explosive pass rusher off the edge and the Seahawks haven’t taken this move lightly. A lot of teams react to the draft, but nobody can fault Seattle for being pro-active. They know what they want, they identify roles and they attack. Irvin isn’t the type of guy you draft on a whim because he’s BPA, you draft him with a vision. Other teams like the Jets drafted Quinton Coples because he was there, and now they have to work him into the system. Irvin was probably in Seattle’s thoughts in January. They’ll know exactly what they want from their latest first round pick and if he can provide an impact in the Raheem Brock-role, then he could end up being one of the most popular players on this team in a generation (his press conference shows why). An improved pass rush and better quarterback play were Seattle’s two defining needs coming into this draft. Irvin and Russell Wilson may well be the answer. We’ll have a reaction post to day three, including game tape, on the blog later today. We’ll also be hosting a Live Chat ‘wrap-up’ tomorrow so stay tuned for that. And when all the picks are in, we’ll start to study them. How do they fit? What are the positives and negatives? I’ll also be publishing a top-30 watch-list for the 2012 college football season. You can see the Day 2 press conference with John Schneider and Pete Carroll by clicking here. They discuss Bobby Wagner and Russell Wilson. In this video Russell Wilson talks about how he idolizes Drew Brees. Will Russell Wilson start in 2012? It’s one of the questions we’ll ask later this week. This is the earliest Seattle has drafted a quarterback since 1993. Matt Flynn’s contract is stacked heavily towards his first season, but it’s not so monumental that he’s untouchable. Carroll has already talked about competition between Tarvaris Jackson and Flynn, now it’ll include Russell Wilson. It may not be the team’s ambition to thrust him into a ‘quarterback of the future’ role, but this is a team that previously hadn’t drafted a quarterback under this regime. Carroll and John Schneider have raised expectations by speaking so glowingly of the guy, so will he get a chance early? More on this after the draft. The war room looked a little deflated after Mychal Kendricks left the board one pick before Bobby Wagner was selected. And Schneider admits, they were focused on the linebacker group. Man, I’m drained. And sleep? Forget it. I watched the Seahawks draft Russell Wilson, a player I badly wanted but never thought I’d get, and then minutes later I switched the channel to watch Michael Saunders hit a game winning 10th inning grand slam in a game they absolutely had no business going to extras in. It was maybe the best moment of the Mariner’s season, and it happened about twenty or thirty minutes after experiencing maybe the coolest draft moment ever for me. To say the least, it was a pretty awesome day. The less awesome part of it? Seeing the Seahawks pass on Lavonte David for Robert Wagner (sorry dude). Wagner is a quality “glue that keeps the defense together” kind of guy, the same kind of guy that’s destined for a future free agency period where for weeks he’s ignored before getting a pity contract (Stephen Tulloch, etc). Lavonte David… he’s a playmaker and a difference maker. He’s the kind of guy who is almost destined for pro-bowls and future “is he over-rated?” discussions on Sportscenter. Bobby Wagner is a good pick, but Seattle stepped over a dollar to pick up a quarter here in my opinion. In fairness, Malcolm Smith really impressed me in limited looks last year* and he has the same size, build, and skill set as Lavonte David. Maybe Carroll passed on David because he believes Smith is poised for a breakout season? A lot of people are talking about the fact that Seattle lost a chance at Mychal Kendricks with their move down. That part actually doesn’t bother me all that much. My grades for Wagner and Kendricks were pretty much neck and neck. I think Kendricks has the higher upside, but both have areas for improvement and room for growth. Wagner was the better of the two in coverage and made fewer negative plays. It is certainly conceivable that Pete and John had Kendricks higher, but I’m guessing it was close. I’m sure they knew that the Eagles would be taking a linebacker at #46 (as much was obvious to everyone), and the Seahawks decided to trade with the Jets anyway. That said, I’ve been saying for a while that Bobby Wagner seemed like too good a fit for Pete Carroll to ignore. In my linebacker writeup from just the other day, I ranked Wagner as the 3rd most likely linebacker target for Seattle in the entire draft (though this is made less impressive by who I ranked ahead of him). I estimated that Seattle would give Wagner a 2nd round grade. When the pick was announced, I was hoping for David, but was half expecting Wagner instead. If you are a regular reader of this blog, you probably weren’t all that surprised either. So what does Wagner bring to the table? I scouted Wagner and wrote a report on him a few weeks back, but all you really need to know is that he is (in my opinion) the best man cover middle linebacker in the draft. I didn’t get to see him drop into zone much, but when asked to cover tight ends and running backs he was on them like a shadow. He’s adequate against the run but nothing more, not yet anyway. Wagner put up some solid stats in his senior year, but that was in a weird hybrid defense that had him playing reps as a pass rusher on the line. While I commend him for showing versatility, the fact is that almost every sack in Wagner’s career came from him playing in a 3-4 OLB type role. As a middle linebacker he produced nothing as a pass rusher. I’m not saying that can’t change, but as of now I’d not expecting Wagner to be much of an impact in the pass rush. In fairness, most 4-3 middle linebackers aren’t terrific pass rushers. The other thing Wagner brings to the table is his speed. Seattle got killed by passes that targeted running backs and tight ends the last couple years. Wagner not only provides an asset in coverage, but even when he’s not covering the target he has the speed to minimize damage on screen plays and safety valve throws. Wagner’s speed also helps minimize the liability that Red Bryant presents against end around rushers. We saw this problem plenty last season against quicker running backs like DeMarco Murray, Roy Helu, LeSean McCoy, and even Kendall Hunter. In a sense, Wagner is going to be the Earl Thomas of the second level. Thomas only had two interceptions last year, but ended up a second team all-pro because he made fewer mistakes and Pete Carroll used Thomas’ speed to allow the rest of the secondary more room for error. Thomas didn’t make a ton of plays, but he was clearly one of the most valuable defensive players in the entire league and was rewarded appropriately. Wagner is going to make plays with his speed so that some of the bigger bodies up front won’t always have to. I get kind of a Doug Baldwin vibe from Wagner. He was told by his family, teachers, and even some of his coaches that he had a 1% chance to ever make it to the NFL, and that he should focus on a different career instead. Obviously, Wagner is going to be playing on Sundays, and probably for a long time. Now that I think about it, this whole draft so far has a “Doug Baldwin’s chip on the shoulder” vibe to it. Bruce Irvin has to prove to the Mel Kiper’s of the world that he wasn’t a reach at #15. Wagner had to overcome doubts just to get this far. Russell Wilson has to prove himself to a legion of haters who think he has no chance in the NFL. Is that an accident? I wonder. At least this year, it appears that Pete with his “always compete” mantra is naturally drawn to underdog types. Seattle added a fourth rounder and a very early sixth rounder by moving three spots in round one, a move that cost Seattle nothing. Moving down four spots in the second for a 5th and a 7th is a terrific deal. Not that Seattle can keep striking gold every single year, but picks like those turned into Kam Chancellor and Richard Sherman in the 5th, and Malcolm Smith and Dexter Davis in the 7th. Losing Kendricks may have hurt for some, but if the right to pass on Kendricks lands us two more players even close to that level, it’s pretty hard to argue. One last thing about Wagner before I move on. Jerry Jones said after today’s draft that he would have taken Bobby Wagner at #45* if he hadn’t traded the pick to move up for Morris Claiborne. If Wagner turns into a pro-bowler, we’ll have to send Jones a thank you card. In their post day two press conference, Pete Carroll revealed to reporters that two teams contacted him after the Russell Wilson selection telling him that they would have picked Wilson right after Seattle in the event that they had passed on him. I know stuff like this might not matter to some, but I think it’s interesting. Part of the reason Seattle has been so effective at drafting under this regime is their uncanny sixth sense for when players are about to leave the board. It also shows that Pete and John were not alone in thinking that Russell Wilson was worth a 3rd round pick. Logan Harrell, DT: Productive, high effort pass rusher, though lacking in size and played in a weak conference. Jared Crick, DT: High motor pass rusher that could produce if surrounded by a good supporting cast. Jonathan Massaquoi, DE: An above average pass rusher that struggles diagnosing the run. Not an obvious fit for Seattle’s scheme, but he’s talented. Trevor Guyton, DE: Rock solid 5-tech depth. Pac-12 connection. Keep an eye on this one. Ronnell Lewis, LB: Can play DE or SAM LB. Special teams demon. Why he’s still available is beyond me. Nigel Bradham, LB: Five star recruit out of high school. Good tape, what little I’ve seen. Great measurables. I’ve heard mixed reviews from FSU fans though. Josh Kaddu, LB: Versatile player that can play outside linebacker and might even be a rotational option at LEO. Danny Trevathan, LB: Fast, highly productive, met with team. Miles Burris, LB: Fast pass rushing option at WILL. Korey Toomer, LB: Zach Brown with a smaller price tag. Marcus Dowtin, LB: Coverage oriented linebacker with speed. Some off the field concerns. James Michael-Johnson, LB: Terrific zone coverage middle linebacker that does everything else pretty well also. Ron Brooks, CB: He’s only 5’10” but he’s very physical in press coverage despite that. Makes a lot of plays. He ran a 4.37 forty with a 38″ vert. One of my favorite corners in the draft. Met with team. Donnie Fletcher, CB: Six foot corner. Met with team. Jeremy Lane, CB: Same deal. Josh Bellamy, CB: Same deal. Also he’s a DB who’s name sounds like Jay Bellamy, which is cool. WR/CB convert like Sherman. George Iloka, SS: Brandon Browner size with good tape at strong safety. Met with team. Chris Polk, RB: I’m hearing that half the teams in the NFL have Polk completely off their boards after it was found that he has a degenerative shoulder condition. Sadly, the Seahawks may be one of those teams. Lamar Miller, RB: Miller fell this far also because of shoulder issues, though I haven’t heard of them being as scary as Polk’s. Robert Turbin, RB: Might be the best running back available if Miller and Polk are scratched for health reasons. Tauren Poole, RB: Under-rated back, very similar to Chris Polk. Terrance Ganaway, RB: Strong, disciplined, productive. He kind of reminds me of TJ Duckett. Vick Ballard, RB: Big, strong, and faster than you’d think. Cyrus Gray, RB: Average back with slightly above average speed. Chris Rainey, RB: A possible heir to Leon Washington in the RB/KR role. 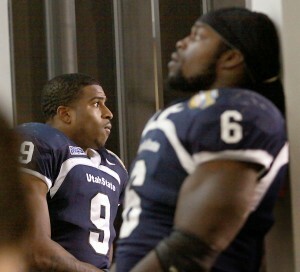 Jeff Fuller, WR: He might have gone second round if not for having such a terrible 2011 season. Dwight Jones, WR: He has small hands and drops a lot of passes, but otherwise he might be a 1st round talent. Wilson and Flynn throw a soft, catchable ball. Juron Criner, WR: Criner has no business lasting this long. He’ll be a quality #2 WR from day one. Marvin Jones, WR: Same deal. Nick Toon, WR: Why not pair Wilson with his top receiver from college? Jermaine Kearse, WR: Highly inconsistent, but seemed to drop fewer balls when Keith Price was there. He has enough talent to merit a late round look for some team. Devin Aguilar, WR: Aguilar was the Huskies version of Ben Obomanu. Marvin McNutt, WR: He had a huge year. I’m surprised he’s still available. Chris Givens, WR: Same deal. Tommy Streeter, WR: 6’5″, 219 pounds. 4.40 forty. 35″ arms. Greg Childs, WR: Great player recovering from injury. Will be a steal for some team. Orson Charles, TE: The best tight end remaining on the board. Taylor Thompson, TE: Very strong blocker with the athleticism to develop into a dual threat tight end. Late round option. David Paulson, TE: Slow forty, but he’s a good blocker and a good receiver. Met with team. Adrien Robinson, TE: Met with team. Derek Carrier, TE: Met with team. Bobby Massie, T: Biggest steal of the draft at any position entering day three. Fits Tom Cable size criteria and has 35″ arms. Andrew Datko, T: He’s shed some weight this year which puts him in the range for a Tom Cable selection. Ryan Miller, G: Good player, bad team. Will Colorado count as a Pac-12 team to Pete?